This time of year, it feels like every night is busy with holiday parties and rushing around running errands for said holiday parties. So it feels downright luxurious to have a cozy night in, especially since it’s been so cold in San Francisco (well, cold for us). 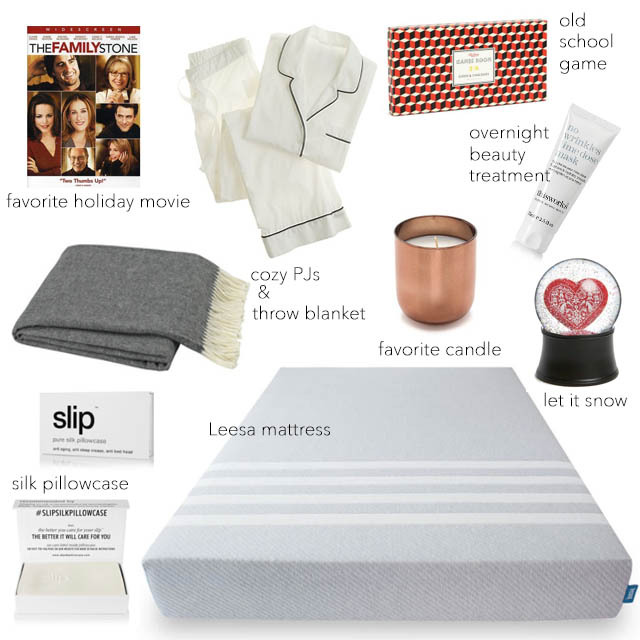 Mattress company Leesa asked me to imagine the perfect night in during the holidays. The Leesa mattress is 100% American made and features what they call a Universal Adaptive Feel™ that adapts to all body shapes and sizes and sleeping styles - ideal for couples (and I’m assuming the dog that sleep in your our bed!). The Leesa mattress ships compressed in a box and you have 100 nights with Leesa to decide, or return it for a full refund. The best part though? Leesa donates one mattress for every ten sold and partners with the Arbor Day Foundation to plant one tree for every mattress sold. Read more here. So what about my night in before drifting off to sleep on a Leesa Mattress? I'd be wearing this J. Crew Vintage Pajama Set because it's so classic and comfy, and I'd warm up with this Lulu and Georgia Gia Italian Herringbone Throw in Charcoal. The Family Stone is one of my favorite holiday movies, but I've seen it so many times that it would be fun to play an old school game while watching. Wild and Wolf makes some beautiful games like this Checkers Board Game. I love lighting a good candle most nights at home, and the Jonathan Adler Pop Bourbon Candle is one of my favorites. The candle can be burnt all year long, but something more seasonal that I love this time of year is a good snow globe. When I have the time, I like to take advantage of a night in with a few at-home beauty treatments, like the This Works No Wrinkles Time Dose Mask. And I've heard great things about the Slip Embroidered Silk Queen Pillow Case, which is supposed to prevent wrinkles and keep your skin fresh while you sleep. Thank you for supporting Short & Sweet Blog and the brands I use in my everyday life.